Roll each dough sheet out on a floured surface. Use a rolling pin to get it even thinner. Using a heart-shaped cookie cutter, cut out 10 hearts per sheet. 20 total. Microwave each packet according to instructions. Or toss into a skillet and heat throughout. Spritz a baking sheet with a little cooking spray, then arrange the hearts on the sheet. Layer with meat mixture, followed by diced tomato, then some shredded cheese, and finally a little cilantro. Place another heart on top and press to seal. Voila, empanadas. Slide into a 375°F preheated oven and bake for about 13 minutes, or until golden brown. Empanada your hearts away, lovers! Just when you thought Valentine's day food was strictly limited to candy, chocolate and plaid unicorns, I go and do something like this. 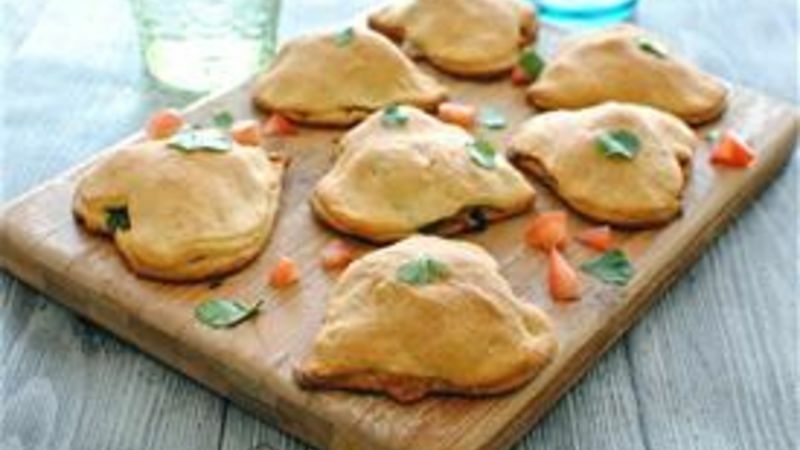 Tex-Mex Empanadas. In heart shapes. And now you can't decide whether to bear hug me or punch me in the face. I know. Actually, I think we're on the cusp of something brand new in the V-day food arena. Fresh approaches, different angles, new territory to explore. But we'll go ahead and serve these fresh approaches inside cute little heart-shaped pastries, to avoid being thrown out of CIVILIZATION. You're leaning towards the face punch, I can feel it. Chop up a little tomato and cilantro for frayeshness. Now, you can either zip these carne asada fillings in the microwave per the instructions on the package, or throw them into a skillet to heat through. I did that so you could see how good this looks. Layer up your fillings. Lil' meat mixture, lil' tomato, lil' cheese, lil' cilantro. Place another heart on top to seal the deal. Get it? Seal the deal? You seal it? Together? Never mind. Bake, bake, bake. Heart-shaped empies! You can call them empies too if you want. I ate 4,000 of them. And I want 4,000 more. I dare you to blindfold your lover and feed him these. No, really. Do it. * Bev realizes that no one will actually throw her out of civilization if these empanadas were any other shape. She just likes to be festive, that's all. Geez. For more musings, visit her blog at Bev Cooks and her Tablespoon profile. What are you having for Valentine's Day dinner?